Synchronous code executes each function or statement in an HTML code sequentially. 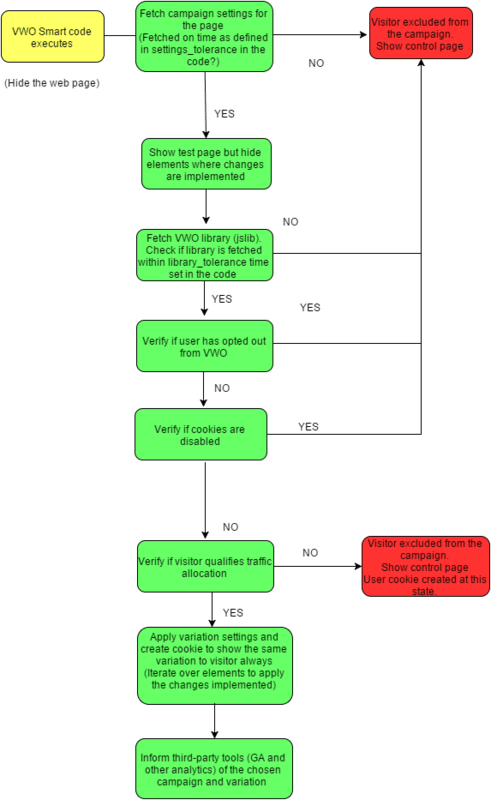 If the synchronous VWO code fails to execute, it will block further execution of the code, thereby delaying the page load time. For example, consider that you have added VWO synchronous code in the header of your webpage’s HTML code and it fails to execute for some reason. In such scenario, the web page will not load for your visitor. If you have jQuery version 1.4.2 or later installed on the page, replace the variable vis_opt.js with vis_opt_no_jquery.js in the tracking code (as mentioned in the code comment). This will tell the VWO tracking code whether it should call the jQuery present on the page or request it from our CDN. Unlike the Synchronous VWO code, Asynchronous VWO code loads in parallel to your webpage and does not affect the loading time of your website. VWO asynchronous code has a timer set for the pages to load and if a page fails to load within the set time, it stops execution and the control version (original version) is displayed instead. It executes in parallel to the page code. You can set the time for which the asynchronous script will wait for the page settings to load, using the variable settings_tolerance. If the page settings load within this time interval, the code requests the VWO library (va.js or vanj.js) from our CDN and waits for the file to load at the interval indicated by the variable library_tolerance. If the page files do not load within the respective time limit, the VWO code on the page will show the control version (original version) instead. If you have jQuery version 1.4.2 or later installed on the page, set the variable use_existing_jquery to True. The variable use_existing_jquery tells the VWO tracking code whether it should call the jQuery present on the page or request it from our CDN. ATTENTION If you are using your own jQuery, make sure it loads before the VWO tracking code. Otherwise, VWO code will not work on that page. Does VWO Code Impact Bounce Rates and Page Engagement? Will VWO Code Create Extra Load on My Website? How Does VWO Smart Code Work? What Is VWO Smart Code?